For those who do not know, Natural News has woken everyone regarding unusual heavy metal content in a wide range of commercial protein sources and this has now led to far more careful formulations and blow back against those unable to comply. I suspect that a lot of the metal content represents no real threat whatsoever, however that only means that it is possible for a specific problem to pass through the filter. Thus this testing tells us were to look and watch. China’s smokestacks continue to bite. These are the same smokestacks that the USA and Europe shipped to China to solve their own problem. Thus this comes as no surprise. I actually know how to solve the smokestack problem and have known for a full thirty years. As usual interest is feigned as whoever attempts to steal the knowledge engages. The fact that it can be solved is already too much of a clue. Yet iT is one problem that can be fixed. (NaturalNews) There's been a whirlwind of change taking place across the protein industry lately. 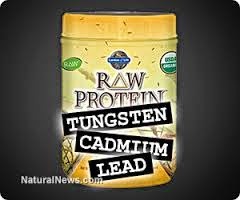 Companies are scrambling to roll out low heavy metals formulas in the wake of Natural News releasing laboratory results finding high concentrations of lead, cadmium and tungsten in organic rice protein products. To gain an inside perspective on what's really happening behind the scenes, I asked a couple of rice protein companies if they would provide answers to some questions readers want to know about. What follows is the first response, from Reno Rolle, CEO of the Boku Superfood company, the company that broke new ground with the surprise release of a Sacha Inchi-based vegan protein formula. Sacha Inchi is a rainforest tree nut, and the protein of it is not only ultra clean; it's also very delicious with a slight nutty flavor. Their new ultra-clean protein is shipping right now from their website, and they've offered free shipping for a limited time during the product launch. What do you hear is happening behind the scenes with protein formulations across the industry? Boku Superfood: Well Mike, you've really created quite a stir! The sweeping wave of awareness arising from your findings in the Natural News labs has shaken up the entire industry. Not only the big brand distributors and retailers of protein powders, but manufactures and even farmers as well. Most companies are diligently searching for alternative solutions and quickly reformulating. I have no doubt we will see some exciting innovation come out of this. In fact, one of the large rice protein manufacturers that we're working with is not only offering a great low metals product using rice sourced from outside of China, they're also developing technology for removing systemic metals from the raw ingredients after harvesting. Now that you've crossed over into the mainstream, thanks to Doctor Oz, consumer awareness for this crisis will soar. This will really help catapult the clean food movement and hopefully create a true climate of accountability and transparency. Why did you pursue a low-metals reformulation of your protein product? Boku Superfood: It's in keeping with our mission to provide only the purest, highest quality super food ingredients on earth. This is much more than words to us. It's a commitment we live by and take very seriously. The moment we learned about potential heavy metal issues more than a year ago, we began searching for and acquiring ultra clean raw materials and started the process of reformulating with these new ingredients. What do you think about the state of protein industry today? Boku Superfood: I think the industry is largely made up of very good people that truly care and want to make a positive difference with quality products. That said, the true character of a company and its leadership can be defined by how they respond to crisis, especially when it involves the health and wellness of their customers. The industry is being severely tested right now. Why did you choose Sacha Inchi as the key ingredient in your new protein formula? Boku Superfood: We first experienced Sacha Inchi when we visited Peru many years ago. When it became obvious that we would need to look closely at alternate vegan protein sources, Sacha Inchi made it quickly to the top of the list and was the favorite of our naturopathic medical doctor formulator, B.J. Adrezin. The environment where Sacha Inchi grows is pristine and it offers a rich nutritional profile and taste that's really unlike anything out there. It's very high in essential fatty acids and works incredibly well with the spirulina and cranberry proteins that round out our triple source blend. How did the Natural News lab results alter your ideas or thinking about raw materials? It provided the sad realization of how much damage [humanity is] doing to our planet and how far reaching the effects are. It also reminded us that everything must be thoroughly tested. It's the only way of knowing with certainty what the true quality of these raw ingredients are. What else do customers need to know about choosing proteins? Choosing proteins should be like choosing anything else we plan to put in our bodies. Consumers need to do their homework and shouldn't hesitate to contact their preferred brands directly demanding transparency. Everyone is different with different likes and needs but we all deserve to get what we're paying for and what we're being sold. Now, more than ever, we need to be aware and careful not to invest our trust blindly. We should arm ourselves with as much accurate information as possible upon which to base these important decisions and personally, I can't imagine a better source for this information than Natural News.